Using video for marketing? There are now 1.5 Billion Youtube users, that is now equivalent to over a third of all internet users alone (source: Techcrunch). Topping that stat is the 300 hours of video being uploaded every minute by users. Yes, that makes Youtube both a popular place to be and a very hard place to stand out. We want to help ensure you make the most out of the opportunity that YouTube gives you and of course get the most ROI from your investment in your video. So follow these rules and you should see an instant benefit to your previous uploads if you haven’t done it before. Naming your video – Have you done any keyword research, check what your competitors use, check the analytics from your previous video to see what had the most success. It is fairly obvious but why would people click on your video if you haven’t explained what it is about when you named it. Description – So many videos get posted the lazy way with just a single sentence and maybe a website link. Part of the reason you should be using video is for the SEO benefits of being found in search queries. How can you be found by Google if it doesn’t know what your video is about? This is your opportunity to tell Google what you want to be found for. In a perfect world use the transcript provided for free by Google and put this in the description. Thumbnail – Yes, you have a choice which image is shown as a thumbnail. Don’t let YouTube Select it for you. Once you have uploaded your video, go to the “Video Manager” and then click “Edit Video”. You can then chose from three options which image YouTube has selected if you aren’t happy then you can always upload your own. Comments – There may be a reason you don’t want to allow comments, so when you have uploaded go to the “video manager” and chose if you want them on or off. If you do decide to turn them off then you will lose the SEO benefits associated with comments. Google sees comments as a ranking factor. Annotations – Similar to the end screen option, this allows you to input calls to action inside the video itself. Offer the viewer the chance to visit your website before the video has finished. Great for companies with products to sell. Cards – Another option when editing your video is to add cards. These are another form of a call to action and similar to the End screen options. For both, you must have linked your website to your YouTube Channel. 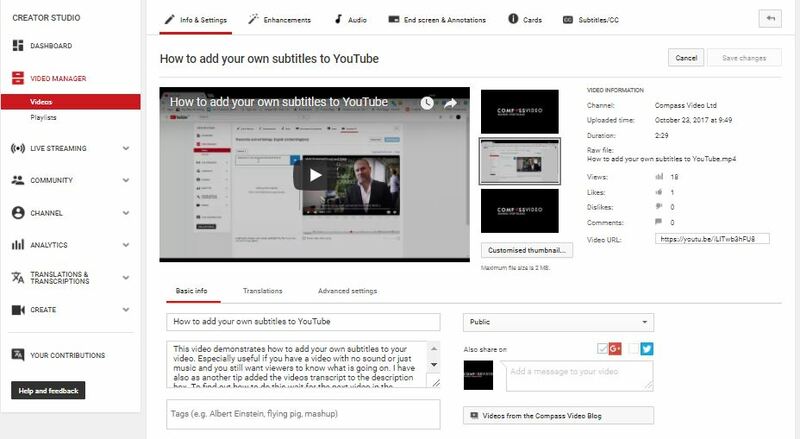 Subtitles – Not a must have because YouTube automatically generates them for you. However, if you are OCD about this sort of thing then read our latest blog on the subject and find out how to add your own or at least change the auto-generated ones. Sharing – When you finally have everything ready, why not keep track of click-throughs from your promotional channels by using shortened URL’s. Google offers a free one here https://goo.gl/ it lets you see how many people have clicked through, on what channel and where they are geographically. We hope this list is of some use to you and if you complete every single recommendation then you might qualify for a Gold Medal in YouTube publishing. Sometimes time is never your friend so chose the ones that matter most to your goals. We will continue to publish these blogs on how to get the most out of YouTube, so if there is anything you wish to know please contact us.